The human mind automatically sorts tasks by their perceived priority. Our laundry usually gets done every few days, for example, because we know we’ll need clean clothes for work. The dishes get washed because we know we’ll need clean ones to eat off of in the near future… etc. Things that affect our personal comfort also rank highly in our minds: No one wants to smell dirty dishes that have been sitting for days or see moldy food in the fridge. Unfortunately, while this kind of thinking works in the short term, it puts out-of-the-way areas in our homes at risk of neglect. Some of these areas—like the space behind the toilet—can become hidden hotbeds for bacteria that go unnoticed for years. To protect your home and your health, we recommend printing out the following list of “cleaning checkpoints.” It details how often frequently-overlooked areas of the home actually need to be cleaned. Using this information, you can develop a weekly cleaning schedule that incorporates everything you need to do. Many people only wash their bed linens when they become visibly stained or dingy. This can be problematic (especially for allergy sufferers) because the skin dander we shed makes excellent food for dust mites and bacteria… And once they’re in your sheets, the next step is infesting your mattress. Prevent this unhygienic build-up by laundering your bedding at least once per week. Make sure to use warm water (not hot) when you do, and follow any washing instructions that came with your bedding. This will help to extend its lifespan. Most of us have been faced with having to throw out a moldy, mildew-infested shower curtain at some point during our lives. Not only is this wasteful, by the time a shower curtain reaches this stage, it’s been harboring a scary array of bacteria for months already. You can mitigate this health hazard and make your shower curtain last longer by washing it (preferably with a disinfectant of some kind) at least once per week. Most shower curtains and their liners can be tossed directly in the washing machine, so this task doesn’t have to be time-consuming. 3. The exterior of your toilet. Fans and vents filter a lot of air, and they collect a huge number of dust mites and allergens in the process. To keep these pesky particles from being recirculated throughout your home, clean your fans and vents thoroughly at least once per month. (Or once per week if you suffer from serious allergies.) Note that ceiling fans are an exception to this rule, and should be cleaned at least once a week. They tend to collect more dust than other fans, and those in the kitchen and bathrooms can gather grime and bacteria. 5. The spaces under your furniture and appliances. 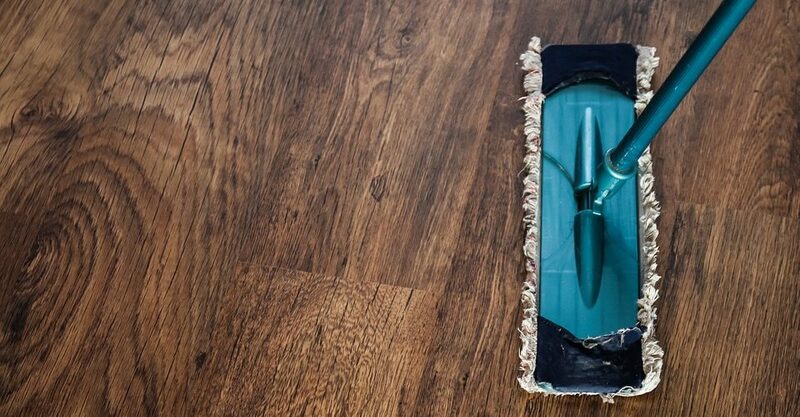 Most people only clean these areas when they drop something and it rolls under the fridge or sofa… Revealing a terrifying kingdom of cobwebs, dust mounds, dead insects, and crumbs. This is a big mistake: Kitchen appliances provide the perfect conditions for mold and bacteria growth, while furniture shelters allergens and dust mites. Make a habit of cleaning these spaces at least once a month, and you’ll save yourself from nasty surprises. 6. The spaces inside your appliances. Though it’s a bit easier to remember to clean out the inside of the fridge, microwave, etc., most of us still don’t do it enough. Appliance cleaning is usually saved for our monthly deeply cleans, when it should really be done every week. Doing so will both protect you from food-borne illnesses and extend the life of your appliances by several years. Appliances that aren’t related to food production or dish washing—like the washing machine and drier—can be cleaned less often. Experts recommend cleaning these out once every few months. Incredibly, many people never clean their mattresses. They just wait for them to wear out, then replace them (usually several years after they actually should). Even if you keep your mattress covered, it’s important to deodorize and disinfect it once every two months. (As alluded to above, some dander and dust mites will inevitably find their way down there.) Sprinkle your mattress with baking soda, let it sit for at least a few hours, then vacuum it up. Finally, mist your mattress with a disinfectant spray to take care of any lingering bacteria. If you don’t have time to attend to detail cleaning each week, consider hiring a cleaning service. They can take care of all your deep cleaning needs, allowing you to just manage the day-to-day basics… And you’ll be rewarded with better health and longer-lasting appliances, carpets, and fixtures.